Worship at Immanuel is Christ-centered, Word-inspired, and Prayer-filled. Our purpose is to worship God, Father Son and Holy Spirit in such as way as to inspire and equip you to live out your life as a devoted follower of Jesus Christ. 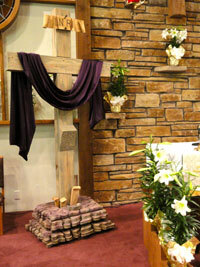 Our communion table is open to all who believe in Jesus Christ and wish to receive this gift of grace and forgiveness. Children who are unaccustomed to receiving communion are invited to come forward to receive a blessing. We are a church family of Christian believers who celebrate with joy the renewing love of our Lord and Savior Jesus Christ. We are committed to learning, sharing, and living the Word of God and His sacraments in our Worship, lives and community. Visit www.lcmc.net for more information. The first services for Immanuel were conducted in private homes by Missionary Immanuel M. Brackebusch of the Wisconsin synod. Carl Peil, Sr., then called together fifteen families on May 1, 1892, for a meeting which resulted in the organization of the first congregation. The fifteen families were: Carl Peil, William Hein, Fred Krause, August Rademacher, John Oldenburg, Charles Abrahamson, Frederick Lehman, William Tischler, Sr., Herman Oldenburg, Emil Krause, Sr., Andrew Polzin, Fred Reh, Otto Ohnesorge and Henry Kirschner. It was in September of 1893 that the congregation incorporated and obtained a charter, under the leadership of Reverend Brackebusch. During the years of 1901-1930, while affiliated with the Wisconsin Synod, the congregation was served by six different pastors, who were paid in part with meat, vegetables and wood to heat their homes. It was customary for parishioners to walk with their families to church, as most did not own a horse and buggy. A yearly mission festival was held in the old town hall (which was at the site of the current post office.) Women made items to sell and many folks brought food from their gardens to help earn money which went to synod to support mission work. 1892 – The first church structure was begun on the site donated by Mrs. John Oldenburg and Mrs. Wohltman. 1928 – Relations with Wisconsin Synod ceased. 1930 – Immanuel Congregation joined the English Evangelical Lutheran Synod of the Northwest of the United Lutheran Church of America. 1962 – Ground was broken for the parish education building. 1980 – Ground was broken for the current sanctuary dedicated in March, 1981.